Every spring, 1.5 million people visit DC in hopes of seeing the cherry blossoms. And the cherry blossoms are a sight to see! 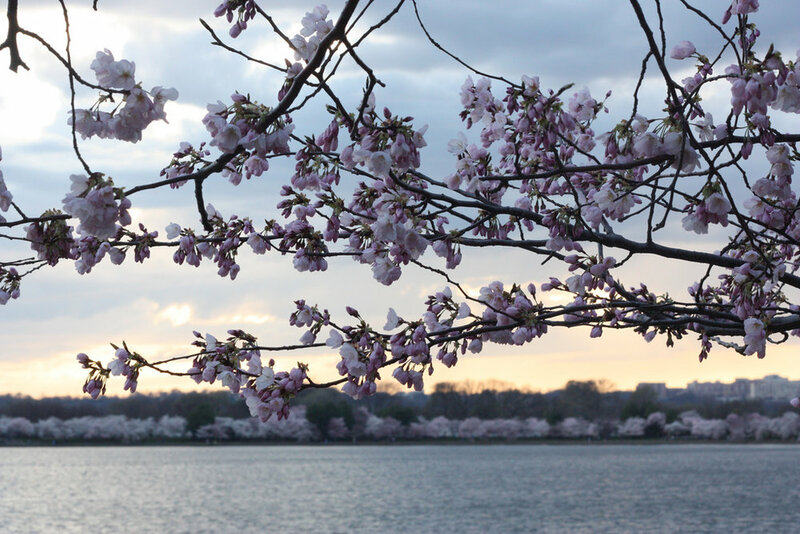 The pink and white blossoms of the cherry trees look stunning around the Tidal Basin and the effect of the petals shedding into the wind creates an enchanting atmosphere. The 3,000 cherry blossom trees were a gift to Washington DC from Mayor Yukio Ozaki of Tokyo, given in 1912. The gift and annual Cherry Blossom celebration are meant to honor the friendship between the United States and Japan. You can read more about this on the Cherry Blossom Festival website. Seeing the cherry blossoms requires bit of luck! The blossoms are only on the trees for one to two weeks a year, they come out when the weather is right, and, due to their fragility, can disappear overnight if gets too cold or rainy. Cherry blossom season has started as early as March 15 and as late as April 18, making it difficult to plan too far in advance. One day can make a huge difference in the size and color of the blossoms. Predictions for peak bloom constantly change, so check the National Park Service Bloom Watch website for the latest information and allow some flexibility in your schedule. Museums and the monuments will be open everyday (unless there is a government shutdown), but the blossoms will not! The monuments around the Tidal Basin are open 24 hours a day, so feel free to wander around the trees in the evening and after dark. Personally, I think this is the best time to take in the monuments - but not a great time to take pictures of the trees. Since so many people come to town during cherry blossom season, you may need to book accomodations well in advance to ensure that you have a place to stay. Expect to find that the price is higher than usual, but staying near the end of a Metro line could save you a couple dollars. I’d recommend staying at a hotel near an Orange or Blue Metro line station, as that line will take you to the Smithsonian Metro stop - the closest one to the Cherry Blossoms. To avoid the crowds, visit the blossoms earlier in the day or, if in bloom, during the week. Weekend afternoons are the busiest times. Avoid driving to the Cherry Blossoms - parking nearby will be difficult to find. If you’re tired of walking, the Circulator bus has lots of stops around the Tidal Basin and National Mall, comes by about every 10-15 minutes, and only costs $1 to ride. If you use a Metro Smartrip card to pay for your bus fare, you can get off and on the Circulator Bus for two hours without being charged again. Don’t let the beautiful magnolia trees fool you - they are not cherry blossoms. Every year, hundreds of photos of the magnolias down on the Mall tagged as cherry blossoms. They are, in fact, a different tree! To add to the confusion, it is likely that magnolias pink and white blossoms will also be out. I definitely recommend visiting the Haupt Garden out back of the Smithsonian Castle to both take in this oasis in the city, snap a few shots of the historic building next to these impostor trees. And finally, large protests have become a frequent occurrence in DC. These events sometimes close Metro stations, buildings, and roads. Unfortunately, I couldn't find a resource that lists these things. Check the news or ask a local to see if anything is going on. Feel free to participate in or avoid these gatherings! Thanks for reading as always! Have you been to the Cherry Blossoms in DC? Comment below about that or your favorite DC experience!